Now this is a ‘foam’ that I know works. I’ve made this lots of times, usually as a foil for spicy shrimp, but last night this crème was delicious, just eaten on a piece of Belgian Endive. And you know I’m eating avocados now, because when I go back to Italy….no more guacamole fore me. The Umbrians don’t believe in avocados. Make the whipped cream. Start with a chilled bowl, a chilled whisk and very cold cream. It will all whisk up in a med-firm cream in just a few minutes of whisking. Quit your whining, it’s a quick upper body workout. Cut the avocado in half, remove the pit (there must be something that you can do with those pits, there are so nice and smooth and round, but yet, they don’t bounce very much). Mush ½ of the avocado into the cream and whisk together. Squirt the lemon juice on the other half of the avocado and mush it into the pulp, then add it to the cream and whisk everything all together. I worry about the lemon juice and the crème not getting along, so that’s why I combine it with the avocado pulp first. Add some salt, little chili powder, give it a mix, garnish with the marinated shallots, and you are good to go. If you want to try this with shrimp, combine some bay leaves, garlic, hot chilies, salt, pepper, and whatever other spices are talking to you at that moment. Leave the shrimp in their shells. Heat a cast iron pan, with out oil. When it’s hot, add a small amount of oil, then the spices, then and the shrimp. Quickly toss and coat the shrimp with all the spices. 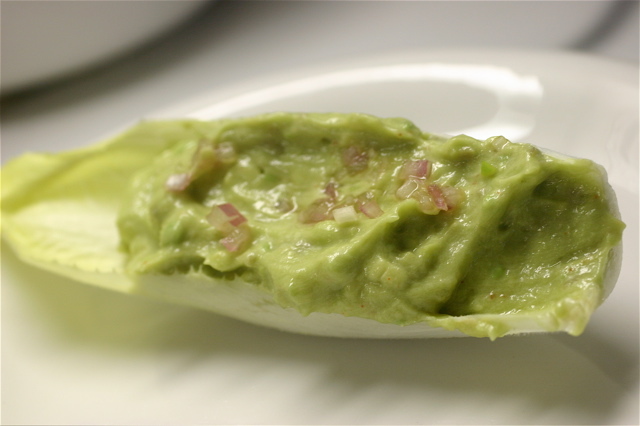 Serve them in their shells, with the avocado crème on as a dipping sauce. It’s cools down the spices and just is an addictive combination.